World 8- Bowser's Castle: Part 2 is the second Bowser level in Super Mario 3D Land. It is the final level of the game. This level requires 100 Star Medals to unlock. It first shows a cut-scene where Mario goes in Bowser's Castle. Then, Mario is on a Spine Coaster and a statue of Bowser's head is shown and its mouth is opened. While going in the mouth, coins will appear on both sides of the Spine Coaster. It then goes down, and a massive fireball comes right at the middle of the coaster. It then turns on the side with more fireballs coming, breaking some small towers. It then turns on the other side with even more fireballs coming. After that, the coaster goes by a Firebar. Next to it, there is a platform, which is raised by a Lava Geyser until it reaches some rock platforms. After these platforms, there are three platforms with fireballs coming out of a gate right above them. The second platform has a Dry Bones on it. Another Spine Coaster is located next to them. It goes down with the rails and is launched by Lava Geysers. The player finds two sets of fireballs. It reaches a solid area, where it is sunk on the lava. There are also some stairs. Atop them, Mario finds three Toads and one of them gives him an 1-Up Mushroom. The player must enter a cannon and shoot Mario to a tower, where it starts to rain. On this tower, another cannon sends Mario to a rainy hall next to the door leading to the battle area. Upon entering, a cutscene plays. Mario (or Luigi, if the player is playing as him) sees Princess Peach, bound to the Goal Pole with a massive bow. Peach then warns Mario (or Luigi) as Bowser falls from the sky and roars a challenge at Mario. The floor cracks and breaks, causing both Bowser and Mario to fall. Mario must then climb the collapsing tower in order to reach Princess Peach. Bowser will try to attack Mario with fireballs and Spiked Balls. After Mario passes a tightrope sequence with some Paragoombas on it, Bowser attacks Mario with barrels in a similar fashion to Donkey Kong from the Donkey Kong arcade game. After this, Mario climbs some stairs until he reaches a bridge, where Mario must get behind Bowser while he employs familiar tactics (Fireballs, jumps, tail whips). Then, the player must bait him into attacking the wall blocking what is assumed to be the final button. The button causes the bridge to collapse, causing Bowser to fall supposedly to his death. A gate is opened and Mario can progress. However, Bowser re-appears, shooting strong purple fireballs that are able to break any breakable platforms they touch. After a lengthy platforming sequence, the screen sets in front of Mario, and he must escape from Bowser, who chases him along the final bridge. 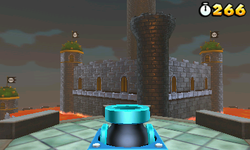 The player must maneuver around the Brick Blocks covering the bridge to reach the actual final button, which causes Bowser to fall again. A cut-scene shows him falling from the bridge while being hit by slabs of rock falling from the tower, eventually hitting the lava. Another gate is opened, revealing Peach. Mario must reach the Goal Pole and free her. A letter showing Mario and Princess Peach. During the end credits, Mario, who is carrying Princess Peach, and two Toads fly from the castle ruins to Princess Peach's Castle, as Bowser attempts to kidnap the princess again on top of a Goomba Tower, without success. After the credits, a letter is shown with Mario and Princess Peach sitting on the tail branch of the Tail Tree and Mario holds a Super Leaf. If the player beats the level as Luigi, a letter showing Luigi and Princess Peach sitting on the tail tree and Luigi looking at Peach is shown instead. After that, if the player has only beaten the game once, a short cutscene appears with a letter floating down in World 1-1, showing Luigi being kidnapped by Bowser's troops. After completing this stage again after beating the Special 8 world, a different letter will float down, showing Peach and a couple of Toads in Tanooki Suits. Star Medal 1: While on the first Spine Coaster, the player must avoid the fireballs. After the first U-Turn, the player must jump to grab the first Star Medal. Star Medal 2: After leaving the first Spine Coaster, the player hops across some wooden platforms. The second Star Medal is found after the second platform. Star Medal 3: On the final Spine Coaster, the player comes across an onslaught of fireballs. The Star Medal is found during the second wave of fireballs. If the player replays this world as Luigi, although it is overall the same, Peach calls out Luigi's name instead of Mario in both cutscenes. ↑ von Esmarch, Nick. Super Mario 3D Land PRIMA Official Game Guide, page 115.